My friend Davaakhuu escorted me to the train station. Goodbye Mongolia. Hello friends, as I write I am relaxing at TransSib Hostel in Irkusck, Russia. I got off the TransSiberian train this morning after 1.5 days of travel from Ulaanbaatar. Before I mention too much about the train, I’ll catch you up with the end of my Mongolia trip and Naadam! Heath skyping a friend with the neighbor boys. When wrestling wasn’t happening, we watched the horse racing. Remember how Dariganga has fast horses because of Toro Band? Well, there were a lot of horse races because so many people raise horses here. There were 6 races (1 per year for the horse) and I watched 3 of them. The first time I saw the horses reach the hillside was quite the sight. I could see a small speck, which was the horse, but I also saw a flood of vehicles following close to their respective horses. Seeing the distance fill up with horses and cars will be unforgettable. 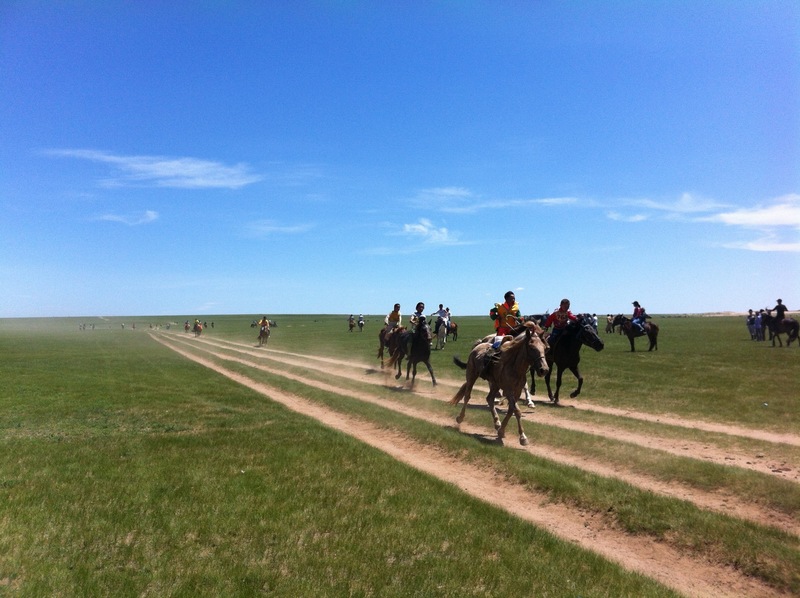 Naadam’s Horse Race. Here is the winner! Heath, Jeremy, and I caught a manure truck back to town and spent the rest of the day relaxing. 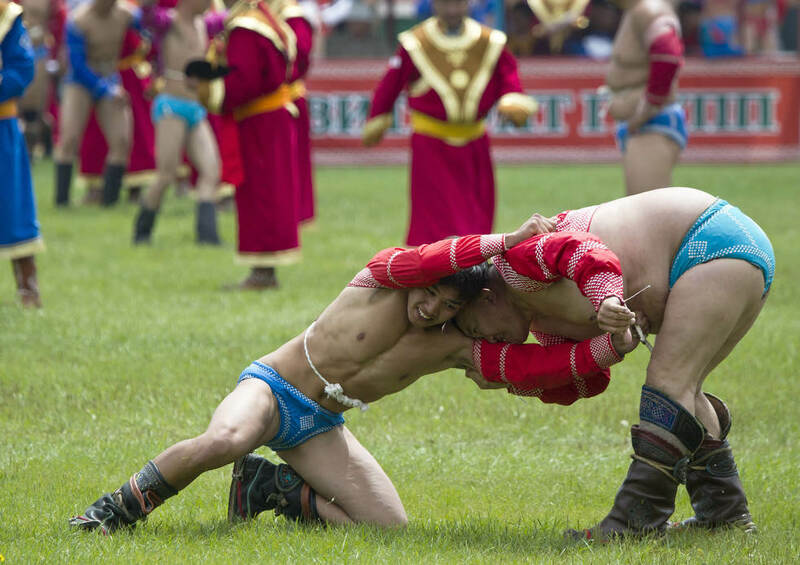 The second day of Naadam was a similar experience, except with more trophy ceremonies. Heath’s host family won 3rd and 5th in two horse races! Very cool. my view on the bus. The monk sat like that for most of the time. 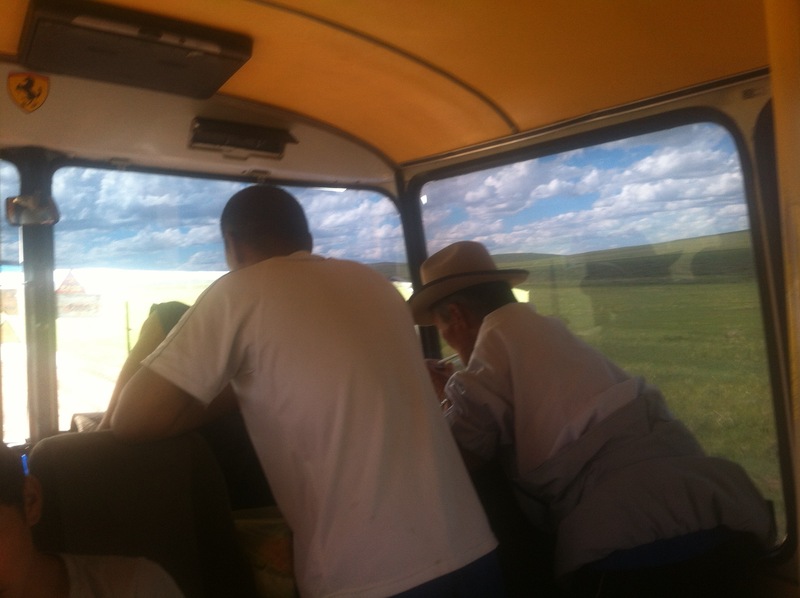 We arrived in UB and quickly caught a bus to Darkhan to go to a small soum called Yeroo. 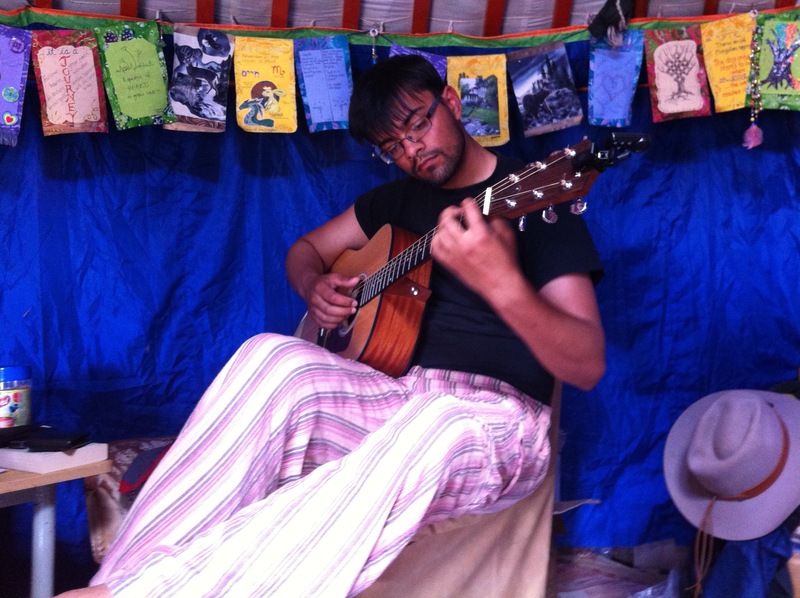 In Darkhan, I stayed with some PCVs and got to play a baritone ukulele. It felt so good. We ate some Korean food too. I sadly didn’t get to know Darkhan that well, but it seemed like a nice place. Heath, Jeremy, and I found the bus station and packed into a taxi with 2 other people and drove 1.5 hours NW to Yeroo. It was one helluva ride, we all got very comfortable with each other by the end. We made it to Yeroo and I was impressed by its charm. The nature around the town was beautiful. There is a river that flows beside the town, a marsh borders it to the SW, and a holy mountain lays to the East. The town itself is also quaint, it has lots of wood cabins, colorful buildings, a nice school, and of course the traditional gers. We were dropped off on the opposite side of town, so I got a good look while walking towards Jeremy and Heath’s host families homes. It was nice to see wooden homes of different sizes and shapes. In Dariganga, the homes were all cookie-cutter (all the same shape), while in Yeroo some had big windows, small windows, 2 stories, 1 story, etc. We split from Jeremy and Heath showed me my new home for the next 4 days. I was going to live in a cute wooden cabin. It was very cozy. The inside was covered with rugs, there was a dry sink, a small table, a fireplace, and 2 windows. I had to crouch to walk inside, but I didn’t mind. After dropping off my stuff, Heath introduced me to my new sister. She brought us bortsig (fried dough) and fresh cream. It was delicious. She then also fed us some rice. I was very full after that. 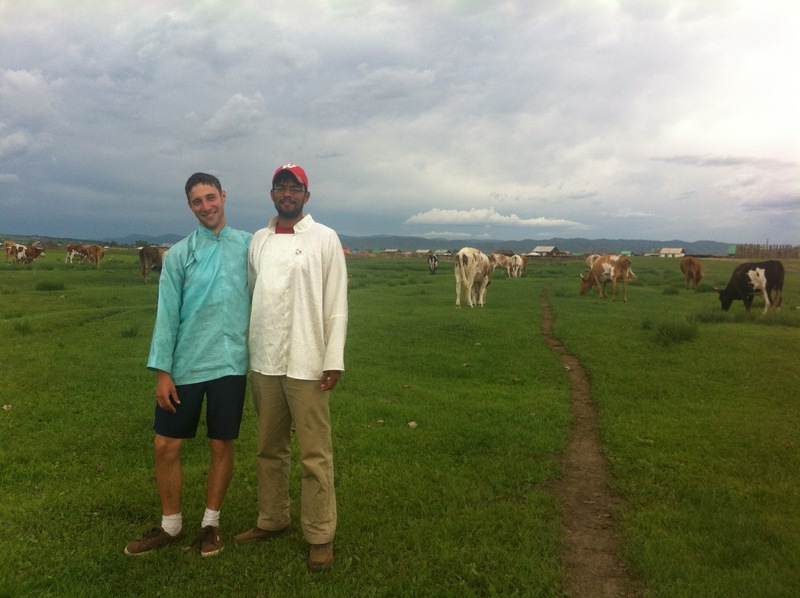 After eating, the family had to milk the cows. Heath and I helped by delivering the recently pumped cows milk to a filtering machine (Heath transported, I poured the milk into the machine, and Heath’s host brother churned the machine.) Heath’s family makes everything they drink and eat. They turn the milk into tea, or yogurt, or Arilth, or other foods. They also have sheep to make food, such as hoosher or soyven. It was very interesting to live with a self sustaining family. I learned a lot from them. Heath and Jeremy making lunch. I made the noodles. Each morning, I ate bortsig with cream (sometimes there was candy too). 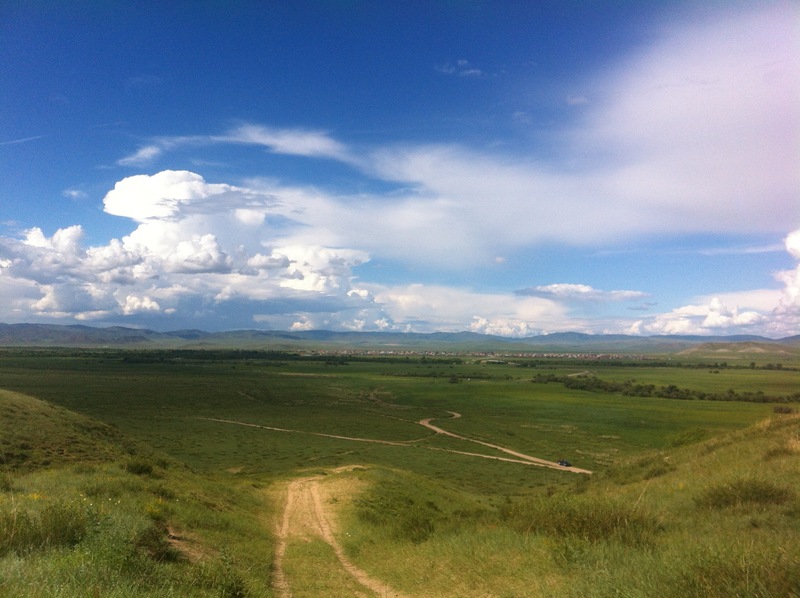 On the second day, it was the 1st day of Naadam. I wore my dell and went to the stadium to watch the events. There was no archery in Dariganga, so I spent a lot of time watching that. Heath’s host sister competed in the event, she got 3rd place! I was also lucky enough to follow the horse race by van. It is a totally different experience following the horses; I felt like I was really in the race. That was a great time! We returned to the stadium, ate some hoosher, and returned back to our homes. 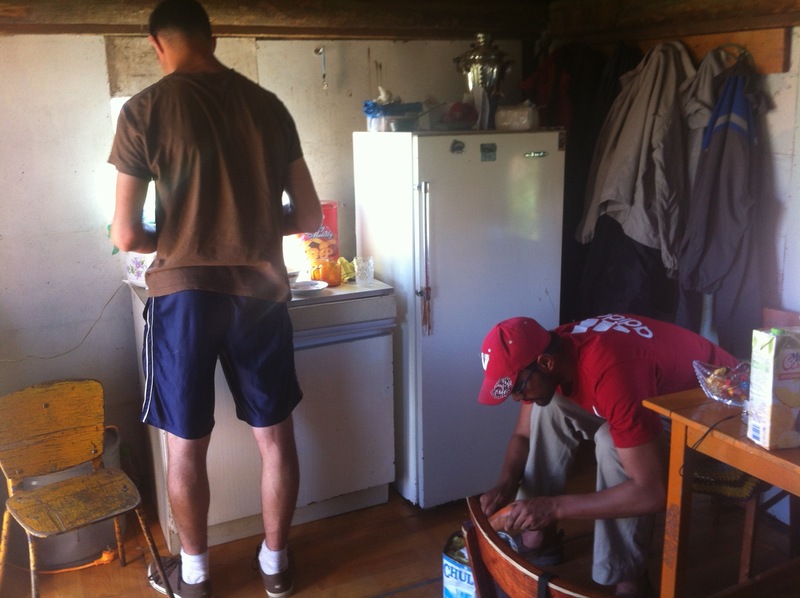 Heath’s family was kind enough to cook us sheep gedis (sheep innards; intestines, liver, stomach, blood sausage, ect.) It is a big deal for the family to kill a sheep, so I tried my best to eat as much as possible. It really didn’t taste bad, it was mostly the texture that got me. (We used the leftover gedis to make gedis hoosher. I helped make it. It was fun!). The hardest thing to eat for me was the sheep head. The next day they boiled the head in a soup of rice and fed it to us and then I was offered the face skin. I had to politely refuse, my stomach has eaten some crazy things, but I couldn’t handle the taste and texture of sheep head. Even thinking about it makes my stomach churn. Bleh. The view from the hill. I can see Yeroo. On our final day, Heath, Jeremy, and I spent most of it hanging out. Their families went to the countryside, so we went to the river, cooked soyven with a fire, and celebrated our 3 weeks together traveling. I really enjoyed my time with Jeremy. He’s an adorably, awkward Wisconsinite who studied international relations in college. He’ll spend 1 more year in Mongolia teaching English and then he will attend Masters school for foreign relations (I think). We had some good times and I’ll miss his company. Thanks Jeremy for the great memories! I think swing dancing in Heath’s ger is my highlight with you. Heath and I went on a long walk out into the countryside. I knew it would be my last time and I was happy to share the moment with him. I am so grateful to have Heath as a friend. He was my guide in Mongolia and he did a great job. I have many fond memories, like the English camp, learning Mongolian waltz, cooking Mongolian food, and our long philosophical chats. Heath, thank you for everything. Aren’t they cute in their Mongol Dells? Well, that’s about it. I’ll catch a bus tomorrow morning to an island 7 hours SE of here that is within Lake Baikhal. I’ll make sure to write about it before I catch my train to Moscow. 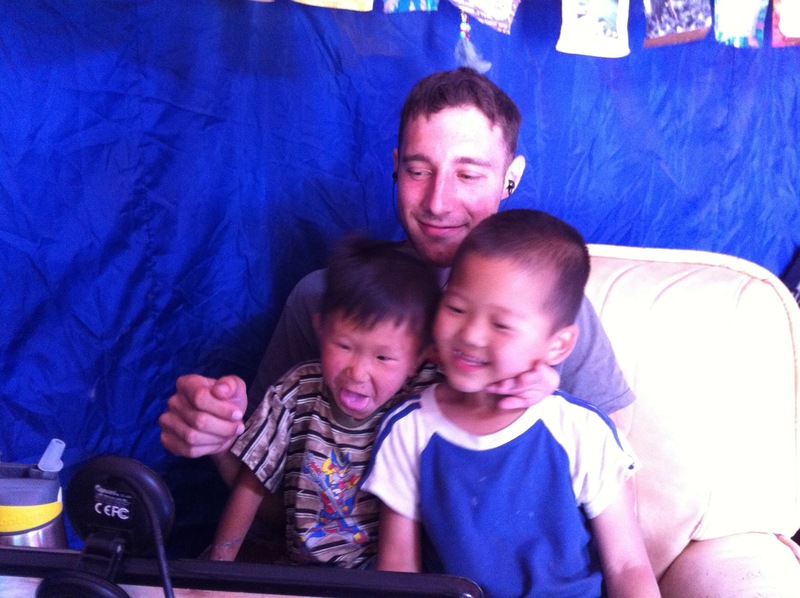 I stumbled across your blog while researching my upcoming Mongoligolia / China. Your blog has been really helpful by giving me a really good honest point of view of Mongolia with a lovely touch of optimism and wonder. Thank you for sharing your story! Chris, I’m glad my blog was helpful! Have fun on your trip. (Will you have a blog?? ).